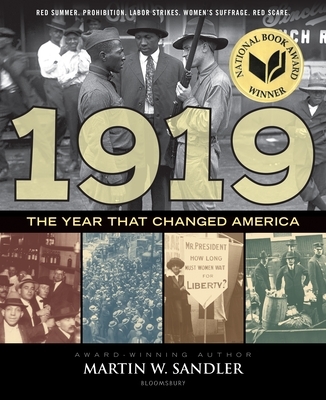 Acclaimed author Sandler examines the pinnacle events of 1919 and their relevance to significant issues in American life today. 1919 was a world-shaking year. America was recovering from World War I and black soldiers returned to racism so violent that that summer would become known as the Red Summer. The suffrage movement had a long-fought win when women gained the right to vote. Laborers took to the streets to protest working conditions; nationalistic fervor led to a communism scare; and temperance gained such traction that prohibition went into effect. Each of these movements reached a tipping point that year. Now, one hundred years later, these same social issues are more relevant than ever. Sandler traces the momentum and setbacks of these movements through this last century, showing that progress isn't always a straight line and offering a unique lens through which we can understand history and the change many still seek. Martin W. Sandler is an award-winning author of many books for young readers, including The Story of Photography, a Boston Globe-Horn Book Award Honor Book, and Vaqueros. He is also a television producer. A five-time Emmy winner and a two-time Pulitzer Prize nominee, he lives in Massachusetts with his wife.